Vandy Vape introduces their Pyro RDTA, a 24.4mm diameter RDTA with a postless build deck and a mixed air intake system. The postless build deck features four terminals measuring at 3mm each with side mounted gold plated screws to secure coil leads. The Pyro RDTA has dual 4mm fill ports in which the top cap features built-in plugs and also features dual 11mm wicking ports for convenient fill. The Pyro RDTA is capable of holding a maximum of 4ml of E-Liquid, however, a chamber reducer is included with the RDTA allows the tank capacity to be limited to 2ml, making it TPD compliant. Airflow enters the Pyro RDTA via dual adjustable airslots that can be adjusted via top cap and can be fully closed. 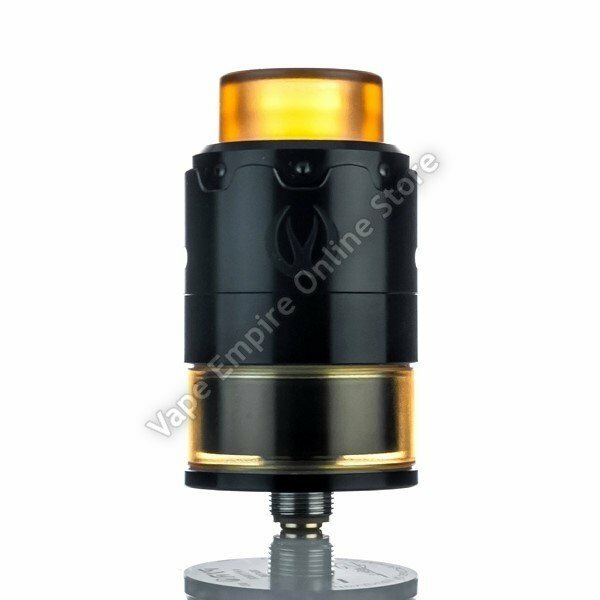 Included with the Pyro RDTA are two 810 drip tips, one ULTEM and one Delrin Doc, a 510 drip tip adapter, and two glass tank sections, one ULTEM and one clear glass. Vandy Vape's Pyro RDTA is a sophisticated and highly functional RDTA that is on the market today!